For a 50cm wide ice maker that comfortably fits under your counter, the Manitowoc RF-0266 can sure hold its own. It delivers up to 82kg of ice per day and can store up to 27kg, all in one. Designed to fit in areas with limited space availability, its industrial-grade stainless steel build withstands corrosion and is fingerprint-proof, too. 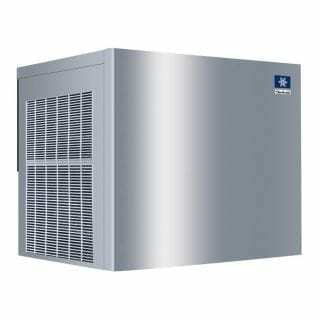 Perfect for the often hectic framework of a commercial kitchen or bar, it features a sliding bin door that slips up and away, allowing handy access to your ice supply. This ice maker comes with adjustable legs for a custom fit to your behind the counter configuration. Flake ice is excellent for contact presentation of drinks, fresh fish or produce, or as a chunky, chewy ingredient in beverages or frozen desserts. So, let’s chill sometime, I mean, if you want to? If you’ve got the extra room, have a look at the Manitowoc RF-0385 and RF-0644 for a nice step up in daily productivity. A: The warranty is 3 years on parts, 2 years on labour; 5 years on parts and 2 years on labour for the compressor.